Pebley Beach’s apprentice in top honours… again! 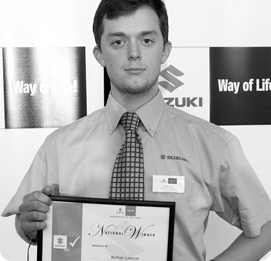 Vox client Pebley Beach have hit the headlines again with apprentice Nathan Lawson scooping top honours at the Suzuki UK Apprentice of the Year Championships. Pebley Beach currently employs ten apprentices at both their Swindon and Cirencester dealerships. This is also the fifth time that a Pebley Beach apprentice has won the title of Apprentice of the Year – and they’re also Suzuki’s UK Dealer of the Year. Great work, many congratulations to Dom and the team from us! A high-achieving PR agency based in Swindon, covering the whole of the UK and beyond. Offering public relations and marketing services from press releases to complete PR campaigns, social media and events to raise your company's profile.